My blacksmith calls these ridges fever rings. Rodney has them on his hind hooves. Mathilda has them on her fronts. He estimates they represent 4-5 months growth, closer to 4. He doesn’t know why one horse has them on the front and the other has them on the hind, unless Rodney’s front rings have been filed off during shoeing. Causes could be fever, i.e. inflammation (hence the name), moving to a new barn, colic, diet changes, or whatever. Something happened within the horse’s physiology to cause swelling in the coronet band which translated in the pronounced bump as it grew out. Four months would represent spring grass. However, Mathilda has been on the same grass for 18 previous Springs (really?!) to no effect. Rodney has seen the grass twice before. Five or so months would be when we added yeast to their diets. Everything I have Googled indicates that such rings are formed due to stressors. I disagree. All the adaptions to the yeast have been positive. Rodney is fat and appears not to be suffering from digestive ailments. Mathilda cleans up her breakfast instead of saving a portion for elevenses. She’s still at it even after we switched half her ration to a less palatable but more nutritious senior feed. Rodney is so slick he feels as if he has been sprayed with Showsheen. It’s not from excessive application of elbow grease, I can promise you. 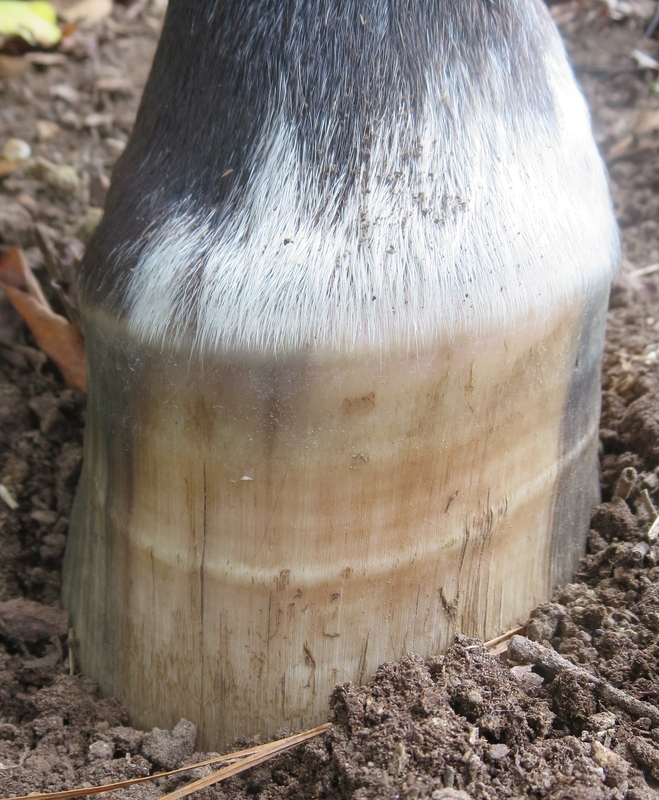 Plus, I think they are growing better quality hoof, best seen on the black hoof above. Blacksmith says it looks better because it’s new. OTOH, I’ve never met a blacksmith who was a dewy-eyed optimist. I’m sticking with my unfounded, positive interpretation. We’ll see what manner of hoof they have in a year. Thanks again to Karen Briggs of Writing from the Right Side of the Stall for recommending the yeast supplement [Tiger Whistle]. How much yeast do you feed daily? (Does it come with a measuring scoop?) 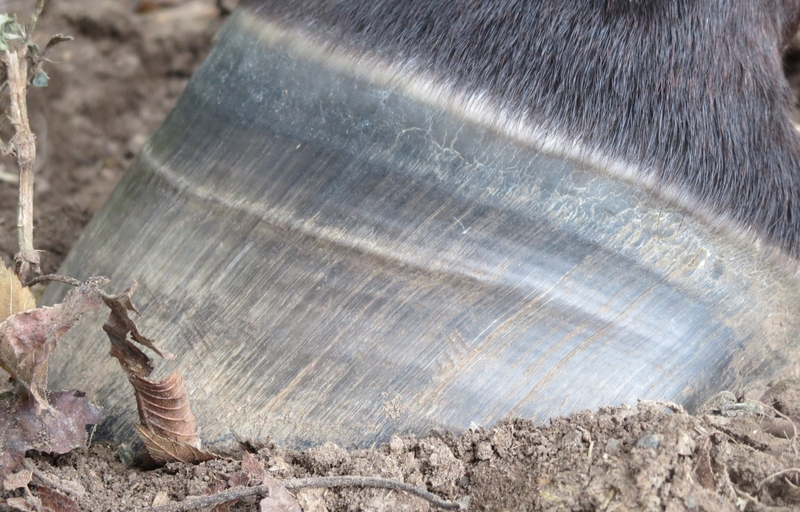 I’ve always wondered if prolonged periods of wet or muddy conditions might be the cause of some of these ridges on horse feet? I’ve also heard the theory of stress, dietary changes, etc. 1/4 cup x 3 meals. Arrived at through a combination of veterinary advice, Internet research & the knowledge that overfeeding would be wasteful rather than toxic. We had a wet summer of epic proportions, but too recently to be the cause of the rings. Interesting. I’ve never seen this on my horses (when I had horses).